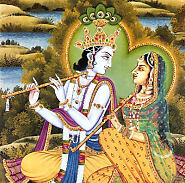 Radha fragte Krishna: "Oh mein Lieber! Warum liebst Du die Flöte mehr als mich? Welche guten Taten hat sie getan, daß sie in engem Kontakt mit Deinen Lippen sein kann? Erkläre mir bitte, mein Herr, das Geheimnis. Ich möchte es so gerne hören." wenn Du Dein Ich-denken vollkommen beseitigst und Dich mir vollkommen hingibst, dann werde ich auch Dich auf die gleiche Weise lieben, wie ich diese Flöte liebe." Sri Radha adressing the flute: "Oh flute you have blessed Me by giving Me the emptiness in your heart, your lightness, the dryness of your body , and your eloquence in constantly chanting the holy name of Krsna, the king of Vraja. 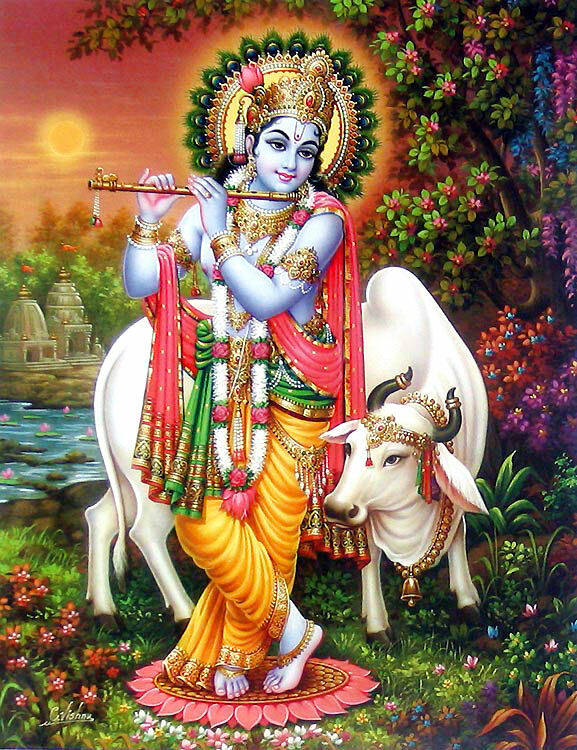 WHY DO YOU NOT GIVE ME THE NECTAR OF KRSNA'S LIPS, which you drink, turn into song , and shamelessly use to enchant the entire world and bring it under your control. " Eine gopi fragte ihre Freundin: Liebe Freundinnen, wie sollten wir jemals Seine Bambusflöte verstehen können? Welch fromme Werke die Bambusflöte vollbracht haben muß, daß sie nun den Nektar der Lippen Krishnas genießen darf!" Krishna küßt manchmal die gopis; daher ist der transzendentale Nektar Seiner Lippen nur ihnen allein zugänglich, und Seine Lippen werden als ihr Eigentum angesehen. Die gopis fragten sich also: "Wie nur ist es möglich, daß die Flöte, die nichts als ein Bambusrohr ist, immerzu den Nektar von Krishnas Lippen genießen darf? Weil die Flöte im Dienst des Höchsten Herrn beschäftigt ist, müssen auch die Mutter und der Vater der Flöte sehr glücklich sein." Die Seen und Flüsse werden als die Mütter der Bäume betrachtet, weil die Bäume nur von ihrem Wasser leben. Deshalb war das Wasser der Seen und Flüsse Vrindavanas voll von glücklichen Lotosblumen, denn das Wasser dachte: "Wie kommt es nur, daß unser Sohn, der Bambusstab, den Nektar von Krishnas Lippen genießt?" Die Bambusbäume am Ufer der Flüsse und Seen waren ebenfalls glücklich, ihren Abkömmling auf diese Weise im Dienst des Herrn beschäftigt zu sehen, genau wie sich auch ein fortgeschrittener Transzendentalist freut, wenn er sieht, daß sich seine Nachkommen im Dienst des Herrn betätigen. Die Flöte Krishnas rief die frommen Gopis, die Mädchen von Vraja, herbei, um ihren geliebten Herrn an den Ufern des heiligen Yamuna-Flusses zu treffen. Der Klang dieser göttlichen Flöte ließ die Herzen vor stürmischer Freude erbeben und flößte neues Leben und Freude ein. Es rief Gottverzückung in allen Wesen hervor und flößte sogar empfindungslosen Dingen Leben ein. Die Süße der Musik war unübertroffen. Wer einmal die Musik von Krishnas Flöte gehört hatte, kümmerte sich nicht um den Nektar des Himmels oder die Wonne von Moksha. 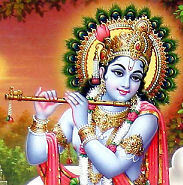 Die Flöte Krishnas und ihre Musik hat die Herzen der Gopis bewegt. Sie verloren vollkommen die Kontrolle über sich, wenn sie die wundervollen Klangschwingungen aus Krishnas Flöte vernahmen. Weltliche Angelegenheiten waren nichts mehr für sie. Sie fühlten sich unwiderstehlich zu Krishna hingezogen. Sie hatten weder Scham noch Furcht, ihr Haus und Heim zu verlassen. In ihnen fand eine Umwandlung statt. Ihre Herzen wurden unwiderstehlich von Krishna angezogen. Der Sanskrit Name Krishna bedeutet: der Alles-Anziehende. Ihre Ehemänner und Brüder hielten sie vergeblich zurück. 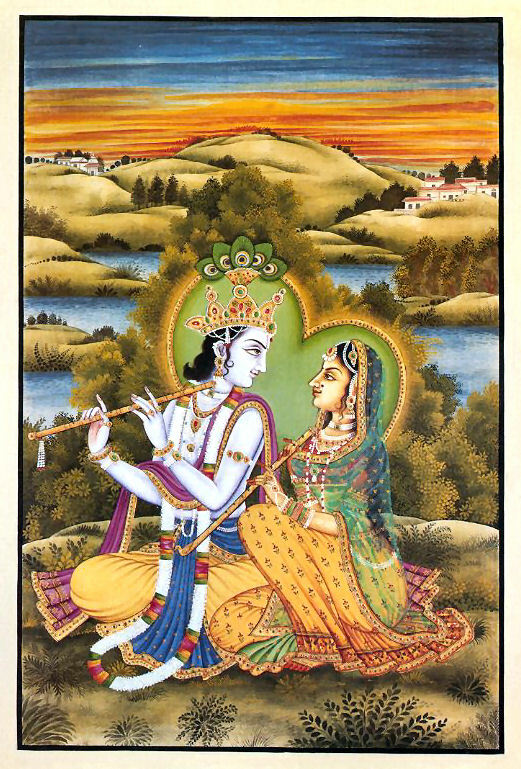 Die Liebe, die die Gopis Krishna entgegenbrachten, war göttliche Liebe. Wer kann dem Strom göttlicher Liebe widerstehen? 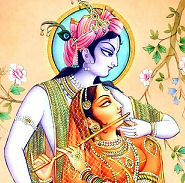 The fortunate position of Krishna's flute. 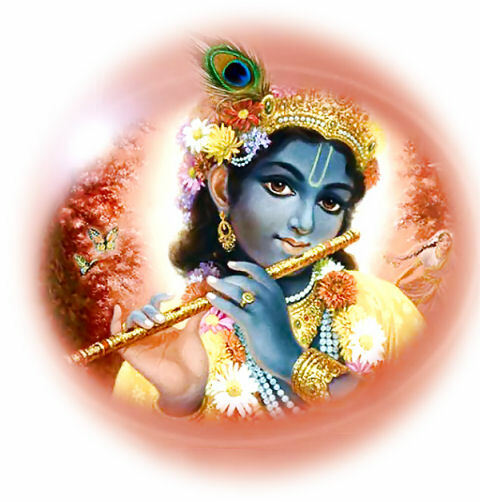 So this flute playing of Krsna is very special, it is explained that Krsna has different flutes and he also plays different melodies for different purposes. 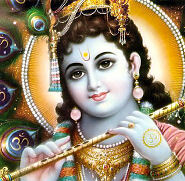 There is 3 kinds of flutes that Krsna uses. 1) Demigods like Lord Brahma and Lord Siva's meditation is broken and they forget everything in astonishment and Lord Anantadeva sways His head like in hypnosis. 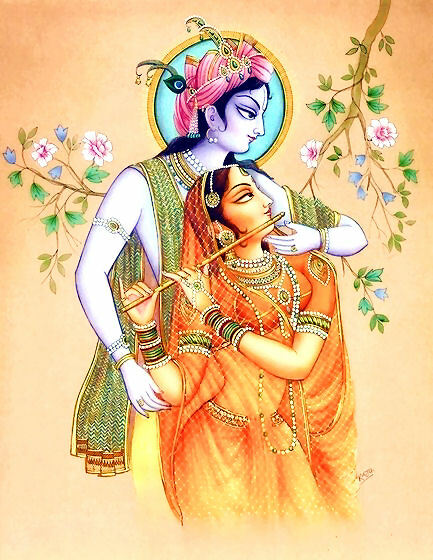 8) 8th Note is meant exclusively for Srimati Radharani, it takes Her name and calls for Her, and She comes running to Him putting Her cloth wrong and mascara also. 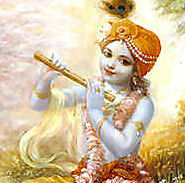 Srila Prabhupada describes that the Venu flute has 6 holes. And it is 6 inches long. The Murali has a hole at the end and four holes on the body. And that flute is 18 inches long . The Vamsi flute is 15 inches long and nine holes. 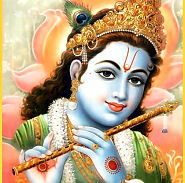 Krsna uses the Venu flute to attract to Gopis, like Venum kvanantam from the Brahma Samhita. 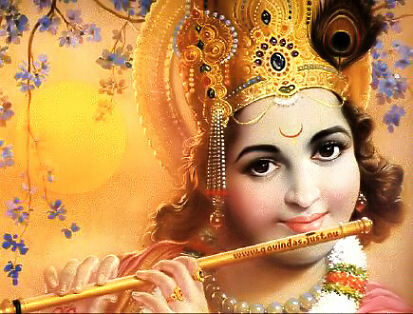 Krishna's flute named Sarala makes a low, soft tone like the sound of a softly singing cuckoo. 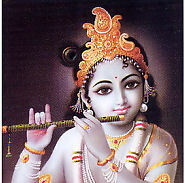 Krishna is very fond of playing this flute in the ragas gaudi and garjari. 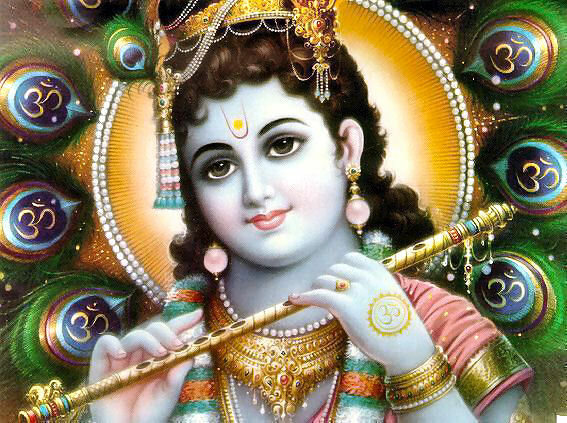 Krishna has another flute named Mahananda, which is like a fishook that captures the fish of Srimati Radharani's heart and mind. Another flute, which has six holes is known as Madanajhankriti. 140. "Aho! 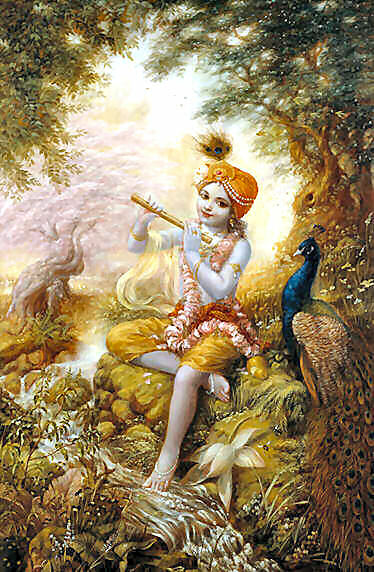 Just as Sri Krishna is the most extraordinary of all incarnations, in the same way His flute, which like the most supremely beloved object always rests in His lotus hand, is extraordinary. My tongue is incapable of even touching its glories." 141. 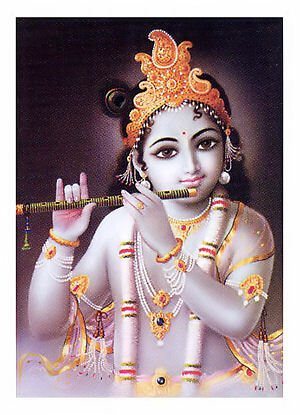 "Still, by His mercy and according to my capacity, I will describe the glories of the flute, so listen carefully." 142. 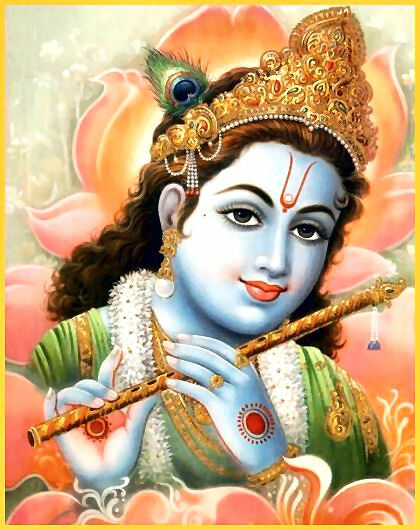 "Because that enchanting bamboo flute has touched Sri Krishna's bimba-fruit lips, its vibration can accomplish things that He could not with His own lotus mouth or through the words of the Upanisads, Vedas, Puraras and other Sriptures." 143. "Upon hearing that vibration, the demigods and perfected souls who were travelling in their airplanes with their wives all fainted in ecstatic love, and Indra, Sri Shiva and Sri Brahma became mystified and forgot their knowledge of brahma (transcendental substance) - in other words, this doubt arose in them: 'Is that which we meditate on brahma, or is this flute melody brahma?'" 144. "Upon hearing that vibration, the great sages' samadhi was broken and symptoms of ecstatic love manifested on their bodies. That flute melody even interrupted the orbit of the moon and other planets, which are eternally travelling on the wheel of time." 145. "How can I describe the good fortune of the cowherd men? In their thoughts and behaviour they were always indifferent to their bodies and everything related to their bodies, they had offered their very souls to the lotus feet of Sri Krishna, they were devoid of any worldly or other-worldly desires, and solely because their wives were very dear to Krishna, they even offered pranama to their wives." 146. 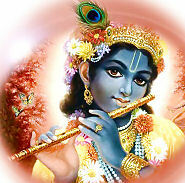 "The sons of those gopas always accompanied Sri Krishna like His shadow. When, desiring to see the splendour of the forest, Sri Krishna would go away from them for even one minute, then not seeing Him they would become extremely distraught. And quickly running to Him, they would receive great satisfaction from touching Him." 147. 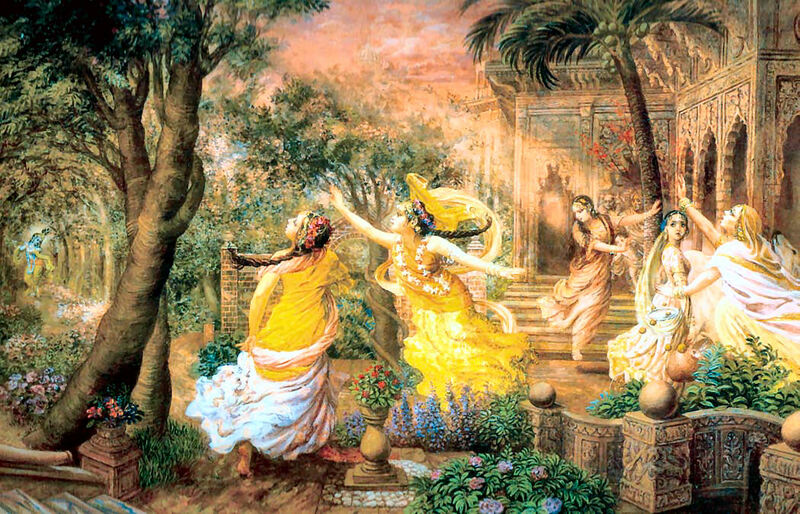 "Hearing the vibration of the flute, the supremely exalted Sri Radha and vraja-gopis, who to meet with Sri Krishna had abandoned their husbands, sons, religious principles, and shyness, attained mahabhava in such a way that becoming spellbound in the simultaneously sweet and poisonous thoughts of Him, they completely forgot their own selves and became motionless like pillars." 148. "Please hear more of the astonishing wonders of that flute melody. When the cows, calves, bulls, deer, the birds who reside in trees, the birds and other living entities who reside in the water, the trees, rivers, clouds and other entities who are devoid of intelligence heard the vibration of the flute, they all abandoned their respective natures." 149. "Upon hearing the melody of the flute, moving living entities became motionless and motionless entities like stone melted and began to move. In other words, the conscious became as if matter, and matter became as if conscious. Plunged into a great ocean of prema-rasa, they all exhibited symptoms of ecstatic love."